There’s a lot going on in the night sky this month: a meteor shower this coming weekend; a solar eclipse visible from Australia and Hawaii; and a beautiful alignment of Jupiter, Venus and Mercury over Memorial Day in late May. Long exposure photo showing shooting stars emanating from a particular point in the night sky. Over the night of May 5/6, you may see one of the best meteor showers of the year — the “Eta Aquarid” shower. Composed of tiny dust particles left by Halley’s Comet on its previous visits to our neck of the solar system, this year’s Eta Aquarid meteor shower promises to be impressive because moonlight will not interfere with the show. When the Moon is out, the bright light of the Moon makes it difficult to see many of the fainter “shooting stars” of a meteor shower. But on the night of the meteor shower’s peak — May 5/6 — the Moon will not rise until around 4:00 am (the morning of May 6). It’s called the “Eta Aquarid” meteor shower because the shooting stars all seem to emanate from a particular point in the constellation Aquarius. 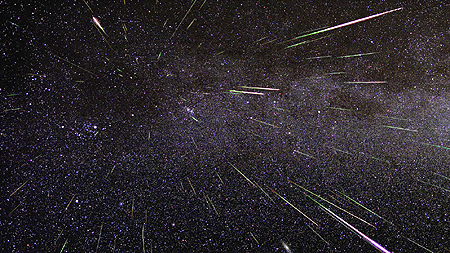 The best way to view a meteor shower is to lie down in a lawn chair or on a blanket — face up — and enjoy the show! No telescopes or binoculars needed. The absolute best time to view the largest number of meteors per hour will be between 3 and 4 am May 6. But really, you can still see a lot of shooting stars the evening of May 5 — and over the nights of May 3, 4, 7 and 8 as well. Those of you in the southern hemisphere of Earth (e.g., Australia, New Zealand, etc.) should get a particularly good view. Remember to bring along insect repellant or warm clothes, as your weather may dictate, and have a great time! A solar eclipse will be visible by residents of northern Australia on May 10 and Hawaii on May 9, weather permitting. Hawaii residents will see a partial eclipse of the Sun, while lucky Australians — who happen to be along a particular, narrow path across the Australian continent that day — will be able to see what is called an “annular eclipse” (pictured here) where the Moon blocks almost all of the Sun, leaving a “ring of fire” around the Moon’s edges. Do not look directly at the Sun — even during the height of the eclipse! The sunlight seen even during an annular/partial eclipse can damage your eyes. Check with local science museums, planetariums and astronomy clubs for information about any special observing programs they may offer during the eclipse … or just watch it on the Internet! No matter where you live, you can watch the eclipse live, via the Internet. In late May — during the Memorial Day period in the United States — the planets Jupiter, Venus and Mercury will align together around sunset, and will be viewable just over over the western horizon. These “planetary conjunctions” do not happen often, so be sure to take a gander at this heavenly display! Facing west-northwest, shortly before sunset on Memorial Day, May 27, 2013, as viewed from the U.S. 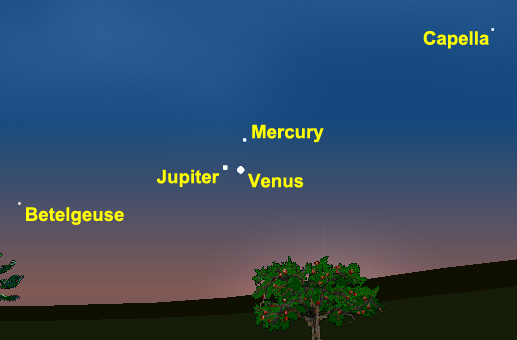 The planets Mercury, Jupiter and Venus form a triangular shape this evening. In fact, they are close together over the evenings of May 23 – 31. You should also see the nearby, bright stars Betelgeuse and Capella. Star hopping is when you use bright, easy-to-identify objects in the night sky to find harder-to-identify objects. It’s like using landmarks on Earth. For those of you in the southern hemisphere of Earth (such as Australia, New Zealand, South Africa, etc. ), you should face east the evening of May 21 as well (your time). 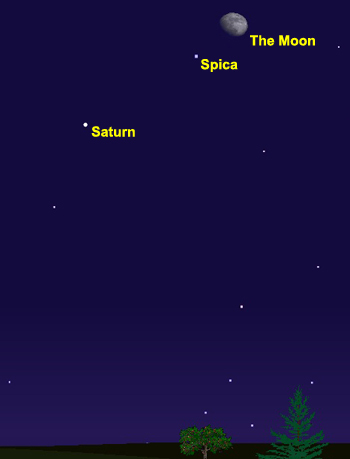 In your case, Spica will be down, and to the right of the Moon, and Saturn will be down, and to the right of Spica. The Moon and Saturn will be in the Name A Star Live constellation Virgo that evening. Spica is Virgo’s brightest star.